Worldwide, but absent from the Palaeartic region (predominantly tropical in distribution). Ectoparasitoids of nymphal crickets (Gryllidae) forming extruding sac-like structures similar to Dryinidae. Pupate in a protected area. Arnold, G. 1935. The Psammocharidae of the Ethiopian region. Part IV. Annals of the Transvaal Museum 15: 413-483, 34 figs. Berland, L. 1951. 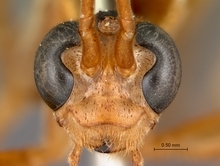 Note sur L’existence  Madagascar de Rhopalosomidae (Hymenoptres Aculeates). Mémoires de l’Institut Scientifique de Madagascar. Serie A. Biologie Animale 5: 295–303. Brothers, D.J. & Finnamore A.T. 1993. Superfamily Vespoidea (pp. 161-278). In GOULET, H. & HUBER, J. (eds). Hymenoptera of the World: an identification guide to families. Research Branch, Agriculture Canada, Ottawa, Canada, 668 pp. Brues, C. T. 1926. Note on the Hymenopterous family Rhopalosomatidae. Psyche 33: 18–19. Cameron, P. 1887. Insecta. Hymenoptera (Families Tenthredinidae –Chrysididae). Vol. 1. Biologia Centrali-Americana 33: 1–487. Enderlein, G. 1904. Paniscomima, eine neue von Herrn Baron von Erlanger aufgefundene Rhopalosomiden-Gattung. Zoologischer Anzeiger 27: 464–466. Gauld, I. D. 1995. Chapter 14.6. Rhopalosomatidae. In Hanson, P. E. & Gauld I. D. (eds). The Hymenoptera of Costa Rica. Oxford University Press, New York. Gess, S.K. & Gess, F.W. 2014. Wasps and bees in southern Africa. SANBI Biodiversity Series 24. South African National Biodiversity Institute, Pretoria. 320 pp. Guidotti, A. E. 1999. Systematics of little known parasitic wasps of the family Rhopalosomatidae (Hymenoptera: Vespoidea). M.Sc. Thesis, University of Toronto, Canada. Guidotti, A. E. 2007. A revision of the wasp genus Paniscomima (Hymenoptera: Rhopalosomatidae) and a proposal of phylogenetic relationships among species. Invertebrate Systematics 21: 297–309. Lohrmann, V. 2011. A revision of the Paniscomima of the African Subregion with the description of two new species from Malawi and Tanzania (Hymenoptera, Rhopalosomatidae). Zoosyst. Evol. 87 (2): 371–378. DOI 10.1002/zoos.201100014. Lohrmann, V. & Ohl, M. 2007. The wasp genus Olixon Cameron in Madagascar: first record and description of two new species (Hymenoptera: Rhopalosomatidae). Zootaxa 1465: 39-46. Townes, H. 1977. A revision of the Rhopalosomatidae (Hymenoptera). Contributions of the Entomological Institute 15: 1-34. Photographs © Simon van Noort (Iziko Museums of South Africa) and Victor Kolyada (Zoological Institute, Russian Academy of Sciences, St. Petersburg).